Mellow Bakers: Grissini ~ I Can Do That! 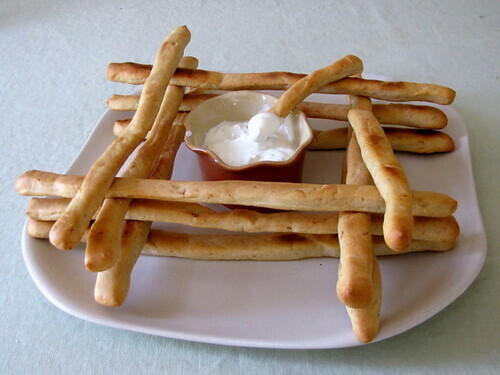 The Italian bread sticks Grissini is one of the MellowBakers breads for May 2010. The bread sticks are very easy to make and the whole process takes less than 2 hours which goes: mix water, flour, olive oil, butter, salt, and yeast; let ferment for 1 hour; roll into a rectangle; cut into thin strips; bake without proofing for 20 minutes or until golden. The garlic studded dough didn't give me any problems other than the bread sticks got eaten very quickly. Easy come easy go. 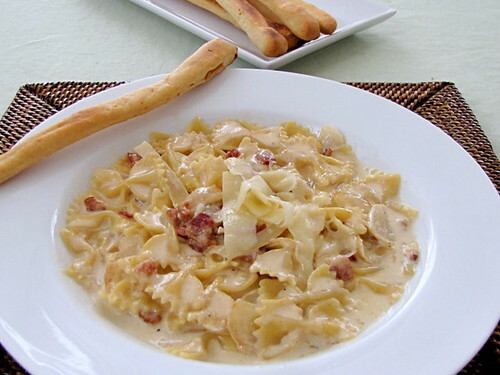 I had these yummy sticks for lunch dipped in sour cream and gorgonzola and also for dinner with a pasta dish that has been a favorite of ours for more than 10 years, Farfalle with Asiago Cream Sauce. Boil the pasta in salted water for 11 minutes. In a large skillet, fry the pancetta until golden brown. Transfer into a plate and remove all but 1 tablespoon of rendered fat. Add the onion and stir fry until soft. Using a skimmer, transfer the pasta into the skillet and stir cook for a few minutes. Add the heavy cream and pancetta. Mix well, add salt and pepper to taste, then remove from heat. Stir in both cheeses. Serve immediately. Joy, you will the corn bread. I have baked it 2 weeks ago and the post is already in draft. I'll finish writing it in a few days. Yummy, I love these grissini. Great combination with that amazing looking pasta!